American Culture Critic: THE MEDIOCRE SEVEN: A Good Film That Doesn’t Merit Its Superlative. THE MEDIOCRE SEVEN: A Good Film That Doesn’t Merit Its Superlative. The above is stated by the widow Emma Cullen (Haley Bennett) in response to a question posed by bounty hunter Sam Chisolm (Denzel Washington). 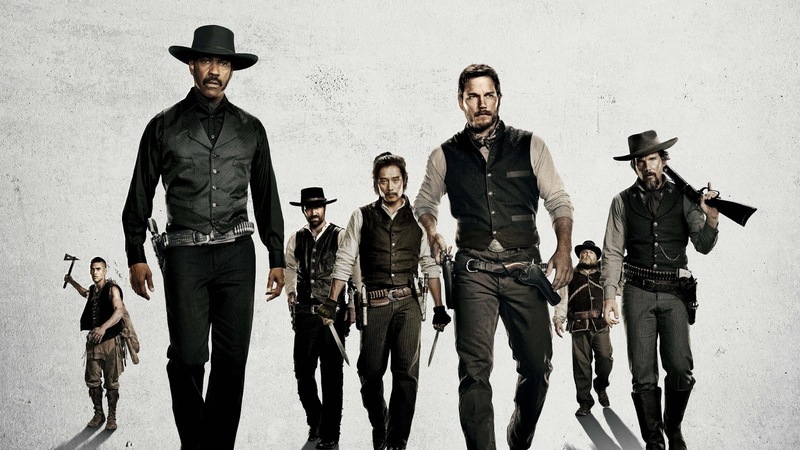 It is a declaration that acknowledges a desire for lofty aspirations, but opts instead for the banal; a sentiment that permeates The Magnificent Seven, a remake of John Sturges’ 1960 classic (itself a remake of Arika Kurosawa’s 1954 cinematic masterpiece, Seven Samurai). It would do the film a major disservice to compare it to its progenitors, for it falls woefully short in comparison. However, it is serviceably entertaining, though frustrating, film on its own merits. Seven, directed by Antoine Fugua (Training Day, The Equalizer), screenplay by Richard Wenk and Nic Pizzolatto, follows the same skeletal template. Ruthless business man Bartholomew Bogue (Peter Sarsgaard) and his private army murders citizens of the mining town of Rose Creek to convince the survivors to sell their land to him for a fraction of its cost or face wholesale slaughter. Emma Cullen seeks out someone to help them before the deadline, and finds bounty hunter Chisolm, who is reluctant to give aid until he is told of Bogue’s involvement. 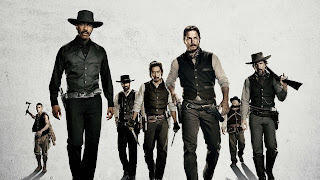 Chisolm then recruits other gunslingers to aid him in the endeavor, consisting of gambler Josh Faraday (Chris Pratt), the tag team of ex-Confederate soldier and expert marksman Goodnight Robicheaux (Ethan Hawke) and knife expert Billy Rocks (Byung-hun Lee), wanted fugitive Vasquez (Manuel Garcia-Fulfo), ex-scalp hunter Jack Horne (Vincent D’Onofrio), and Comanche warrior Red Harvest (Martin Sensmeier) to engage in what may be the town’s last stand. Though the setting is set in the Old West, it’s a thoroughly modern film in the sense that it’s infused with 21st century sensibilities. Instead of a (mostly) Caucasian cast in the 1960 film, the main cast is racially diverse, which lends the film with a more fantastical air than it should possess and incongruous for the era it represents. Yes, there were cowboys (and cowgirls) of all races and creeds. The point is that the racial prejudices of the era go largely unaddressed; a laudable and a long time coming sentiment for a story set in modern times, but inauthentic for its milieu and requiring a major suspension of disbelief. Such could be overlooked if it weren’t for the fact that there’s practically no conflict between the seven. Set ups for conflict galore: scalp hunter and a Comanche powder keg here, a Mexican in-joke there. Instead, hinted at possibilities and never developed. Drama is derived from conflict, and the differences between the seven are muted so that the eventual camaraderie between them is just an unearned, foregone conclusion; the characters are reduced to paper cutouts with no real empathetic investment. This is no fault of the actors though, as they all seem to be thoroughly enjoying playing cowboys. The surprising thing about their performances are that, given that many of them have worked with the director, or each other before (Fugua, Washington, Hawke, Training Day; Fugua and Hawke, Brooklyn’s Finest, Fugua, Washington, and Bennett, The Equalizer, Pratt and D’Oronfino, Jurassic World; etc. ), their work as a whole feels cookie-cutter bland. But then, despite the fact that this is an ensemble piece, the bulk of the work go to Washington, Pratt, Bennett and Hawke. As such, it’s no surprise that the rest get the short shrift in terms of satisfactory character development. Unfortunately, it undermines any possible emotional payoff that could have been derived from their interactions (though D’Orinfino’s Horne does come close to eliciting some poignancy). Another thing that works to the film’s disadvantage is its penchant to eschew iconography for matter-of-fact realism. The cinematography is only beautiful when it could have been majestically evocative. It acts as travelogue for the YouTube generation. The film’s meat and potatoes are from the narrative, as everything is shot in paired down fashion. Unfortunately, its pacing is quixotically disjointed. The film plods where it should move briskly and, even more egregious, rushes moments meant to be held. One of the basic hallmarks, and arguable necessity, of any western is the building of suspense; of using stillness and anticipation to ratchet tension in the viewer so that when the moment of action happens, the audience is ensnared in the payoff viscerally. For the majority of the film, this isn’t the case except for one instance near the climax. As such, the film’s impact is limited; not gone, but limited. The action sequences are extremely well executed and attention grabbing and, again, the actor’s performances do draw one in, as does the soundtrack. For his last, posthumously-released score, James Horner’s treatment (fleshed out, adapted, and completed by his colleagues Simon Rhodes, orchestrator/conductor J.A.C. Redford, and music editors Joe E. Rand and Jim Henrikson) serve as a stylistic “greatest hits” for the late composer, with his acoustic trademarks evident throughout the score, giving epic weight that the film would lacks without it. It services the film by elevating it beyond its limitations; a fitting tribute to a sorely missed cinematic composer. In all, The Magnificent Seven is merely mediocre. It is entertaining on the whole, but it’s undermined by its own self-consciousness. By eschewing the tropes that made the original a seminal classic in not just the Western genre but all of film, it only calls attention to them. It is a vehicle that is bogged down and neutered by its own political correctness. It’s not innovative. It’s a by-the-numbers affair that offers little more than an enjoyable shoot-‘em-up. Ironically, there is one shot involving Washington’s Chisolm that happens before the climax that hints at what could have been. Alone astride his steed, his back towards the camera, his form obscured in silhouette, looking off in the d by the rising sun anticipating the arrival of his foe…a vista of crimson turning blue…for just a brief moment, Fugua presents a scene that epitomizes the epic, and then it’s gone, and the mundane sets in. It reaches for greatness, but settles for mediocrity…and misses out on something truly magnificent.